You can be authentic, social, and a great publisher. Or you can buy likes and follows. Most brands would prefer the first option. Unfortunately, as a growing number of brands wake up to the value of Instagram as a marketing platform, we’re seeing a spike in the use of Instagram bots for likes and comments. To speak to the issue from a perspective concerned purely with brand-image, Instagram bots present another problem: they make your account look inauthentic. Instagram growth hacking can be done. But bots aren’t the way to go about it. 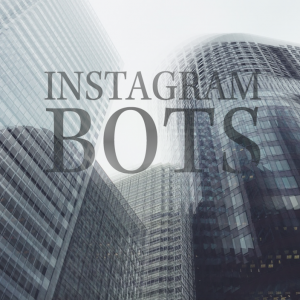 If you’re new to the world of marketing automation, “bots” are Instagram accounts that automatically like, comment, and follow on your behalf. These fake accounts generate a storm of activity, and Instagram ruthlessly kills them at any and every chance. Our story picks up with HootSuite blogger Evan LePage’s post, “I Tried Instagram Automation (So You Don’t Have To).” To get the full story on bots and Instagram growth hacking, LePage engaged the services of Instagress, a company that “allows you to enter specific hashtags you want to be associated with and then automatically like photos or follow people based on those hashtags,” writes LePage. LePage wanted to see what else was out there in the world of Instagram growth hacking, so he employed Instagress’s automated follow feature. The main problem with automated following, LePage found, was that his personal Instagram feed was trashed. Autofollow is fairly indiscriminating, sucking everything into its vacuum and rendering the user’s feed worthless. Next stop: Instamacro, a similar Instagram bot service that can follow other accounts at the rate of 3-5 per minute (all based on the hashtag-guidelines you establish). Again, LePage’s feed was wrecked… and his audience had become dominated by fake and spam accounts. Worth it? No way. There are other, more legitimate ways to build your Instagram. Are There Alternatives for Instagram Growth Hacking? Absolutely. Authentic, quality content will always trump all. I’m not going to lie to you and say numbers are unimportant. However, your numbers are not nearly as important as your content. Focus on creating excellent content and using legitimate techniques to build your Instagram audience, and the numbers will come.